It was Callum's birthday and Imogen made pancakes with honey, lemon juice and sugar for breakfast. Yum! Then we did our jobs. Sophie and I hurried so that we would have time to make Callum a birthday present. When it was time for presents, I gave him the wristband that Sophie and I had been sewing for him. It is grey and black with beads on it. Then Sophie gave him a knotted bracelet. Callum likes wristbands. Mum and Dad gave him a huge TV. Mum was going to buy a small TV but Callum added some more money so he could get a bigger one. Charlotte gave him socks and Imogen gave him two recharging cords. Then Mum and Callum gave us chocolate and stickers as unbirthday presents. We don't usually get unbirthday presents. I was surprised! Mum said it was time to get our swimmers on. We go swimming every Saturday morning. After my swim lesson we went home and had a quick lunch. We then set out to go bowling. Sophie and I were allowed to go in Callum's car. Wen we got there we had to find the right sized shoes. 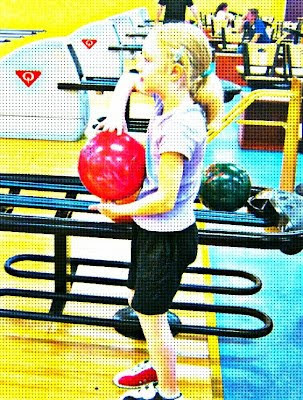 I liked bowling even though I never threw the ball right. It didn't matter. I still knocked the pins down. Every time I threw the ball, it crashed onto the floor. I am surprised the floor survived. Dad, Sophie and Mum were great. Mum won the first game, then came Sophie, then me and Dad was last. On the next game, Dad came first, Sophie was next and Mum and me nearly tied. Mum got only one pont more then me. On the way home Dad gave us some potato chips. When we did get home we had nachos for dinner. That is Callum's favourite dinner. Afterwards we watched "Cloudy with a Chance of Meatballs". After the movie, we had birthday cake. Mum gave Callum a huge bunch of twenty balloons because he turned twenty.